Hi all, I hope you're well out there wherever you are. I'm doing well - I've been staying with friends in north Yorkshire in the dales, going for walks, days out, and getting my van ready for the next stage of my trip. Its taken a while to get everything sorted out, but next week I'll be beginning my journey south, via the peak district and Bristol, and making a few more visits on the way, until I reach Plymouth docks on 19th October..
From here I'll be boarding a ferry to Santander in northern Spain, then driving south through Spain and crossing into the heart of Portugal. 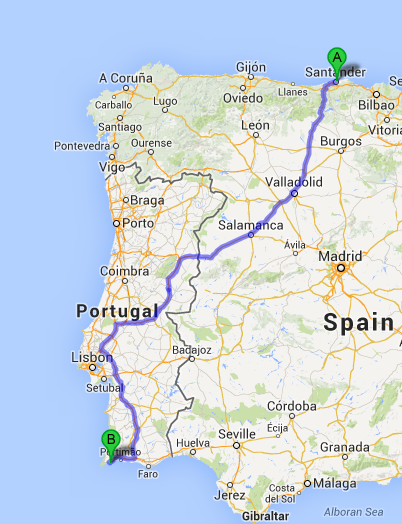 From there I'll continue south, all the way down to the Algarve, where I have some work lined up for the winter months. From where I am now it'll be a journey of 401 miles to Plymouth, and then a 24 hour ferry crossing to Santander, followed by a 685 mile drive through Spain and Portugal. 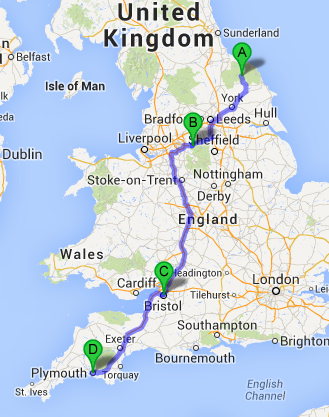 That makes about 1000 miles of driving ahead! I don't plan to do it all in one go though.. I'll be stopping at a few, yet to be decided, locations on the way through Spain and Portugal, though my main route will the that shown on the map. In the meantime, I've ordered a GPS - my iPhone won't work there, and I've given up on the idea of getting sim cards to get 3G there. You can pick a decent used one up for about £50 on eBay. My van will be going in for a few modifications on Thursday - more on that coming soon, but it'll be ready for a few adventures in the south. I've chosen the Algarve as a winter destination as I want to be able to go through a winter in mild weather, and its a completely new culture and experience for me. Its also a great location to explore and reach out into new adventures when the time comes. Its not far across into the Mediterranean, and even north Africa is within reach - who knows what lies ahead! I'm certainly getting excited about the next stage in whats turning out to be an epic journey..
And here I'd been wondering what your winter plans would be! Please keep posting--it sounds like a wonderful adventure is ahead.